I’ve arrived late to the Bloody Mary game. Which is strange considering my love of alcohol and my ability to handle a LOT of alcohol during my teens and twenties was very strong. I mean, this is a cocktail you can have without judgement at breakfast for crying out loud. All those breakfasts wasted on coffee and tea when I could have been drinking vodka. I’m now in my 30s and despite the fact I’m still a student, my iron liver is long gone. Not to mention the fact I just can’t physically handle the hangovers any more. Hands up everyone who now has to schedule nights out on a Friday night JUST so they can make it to work on a Monday morning? Yep, the struggle is real. So while the twenty-something inside me is thrilled that I can justify vodka at 10am whenever the occasion arises via the medium of a Bloody Mary, the 31 year old sensible side leaves the alcohol out except for special occasions. Most of the time I have a Virgin Mary and I know the fact that I enjoy it all the same is a right of passage to adulthood. For the uninitiated a Bloody Mary cocktail typically contains vodka, tomato juice, spices and citrus juice however it isnt the ‘worlds most complex cocktail’ for nothing because these are simply the base ingredients to start with. 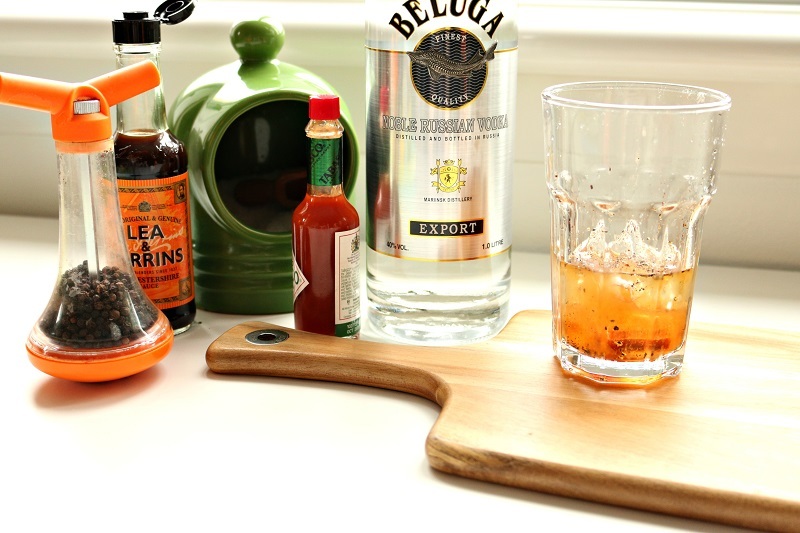 On top of this you can add an array of different garnishes and alcohol, not to mention the fact a Bloody Mary differs for each person drinking or making it. 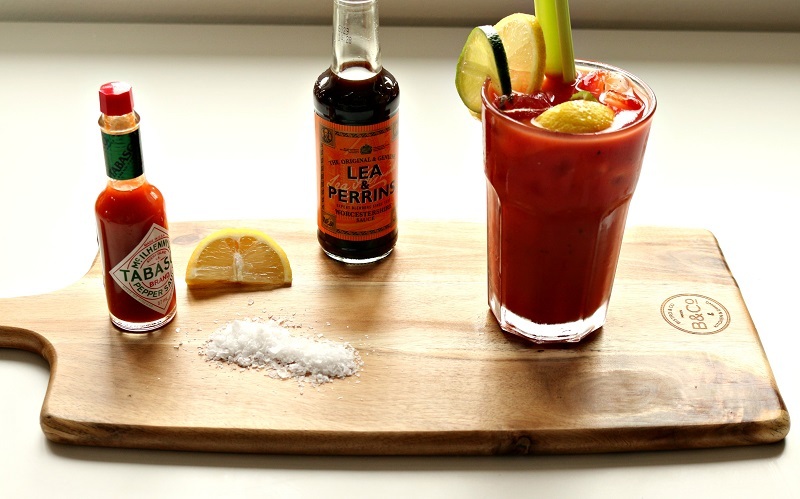 Simply put, no two Bloody Mary’s are the same. 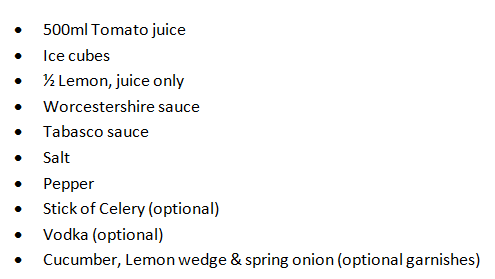 Most people are put off with the tomato juice which I understand, the prospect of drinking a glassful of pasta sauce isn’t very appealing, but there is no other drink quite like it. 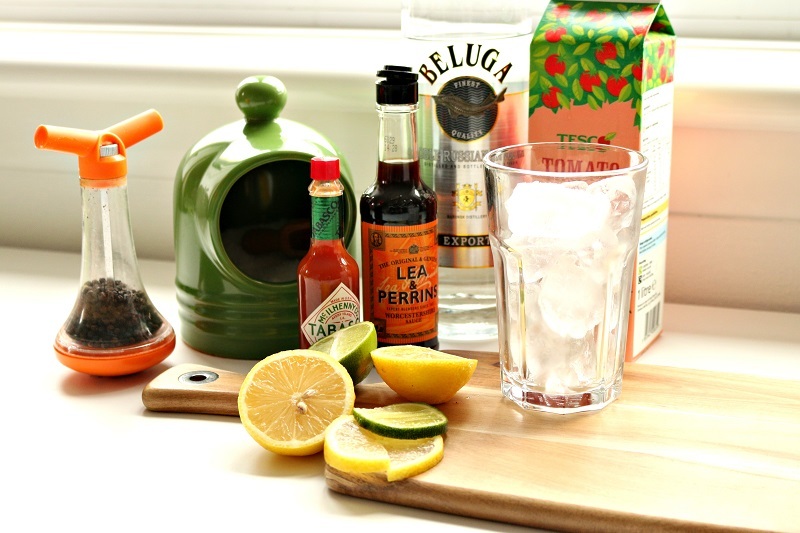 It’s savoury but refreshing and the spicy kick or jolt of vodka really does get me moving on a lazy Sunday. 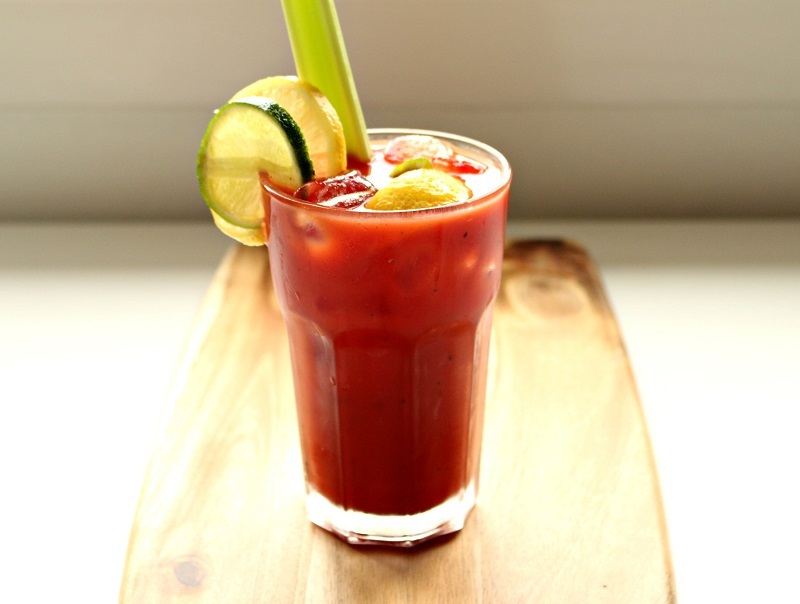 This recipe is for 1 Bloody Mary but you can easily quadruple the quantities to serve a jugful if you have people coming round. Or if you are still in your 20s. Drop the ice cubes into a glass large enough to hold 500ml of liquid. Add 1 shot of vodka and squeeze the lemon juice into the glass. If you like a spicy Bloody Mary shake the Tabasco sauce over the ice cubes for the time it takes you to quickly count to 10 (none of that Mississippi business here). Do the same with the Worcestershire sauce. If you aren’t keen on spice then add the Tabasco and Worcestershire sauce sparingly. You can always add more later. Add the optional garnishes, a pinch of sea salt and ground black pepper. 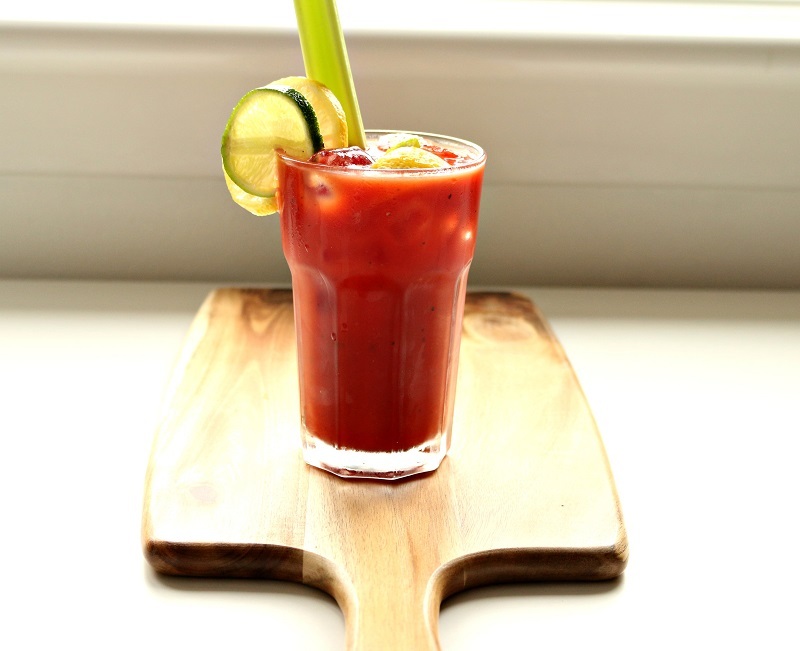 Top up the glass with tomato juice. Stir with a stick of celery and taste. Adjust the spices if you need to before adding a final flourish of black pepper. Now kick back and enjoy. After a few sips you’ll be cursing yourself for not making a jugful.